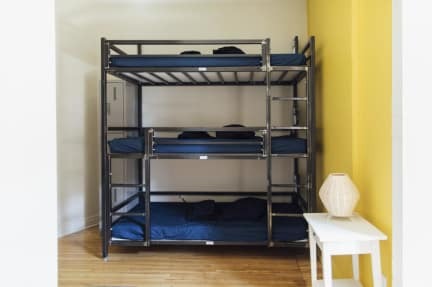 Please come to discover our new Hostel situated in the city centre of Montreal. We are trying our best to make your stay as enjoyable as possible. All our dormitories are equipped with Air Condition and lockers that can be closed with a pad lock. If you desire more privacy, we also offer private rooms. All the showers and bathrooms are completely renovated. Included in the price is the breakfast which we are serving you in the bar-restaurant of the Hostel. 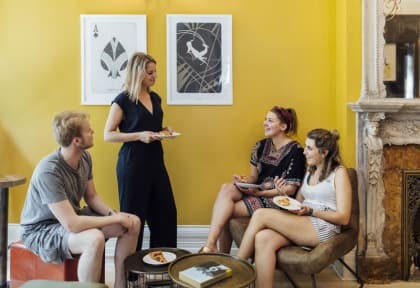 The Hostel also has a kitchen, completely equipped with all the utensils you might need with a dining room that our guests can use if they want to prepare their own meals. You have free access to our WIFI. You can relax in the comfortable couches by the reception or profit from our TV and even the computer we set up for you. The team of our Auberge Bishop would be very happy to welcome you here! my wife and I stayed for just 1 night. it was our first time in a hostel and we liked it. staff was really helpful, great breakfast, showers and rooms clean. Instalações boas, achei limpo. Um ponto positivo para mim foi a ducha: cada ducha é dividida em duas partes, o que possibilita a troca de roupas antes e depois do banho. Café da manhã justo. Ótima localização. O staff parecia um pouco "away", mas nada grave.